Affordable Webmail Hosting is part of the Reselleris commitment to ensuring that everyone has the opportunity to host their own fully-featured web site. Reselleris.com offers a wide selection of other free software installations to help establish your site, that can also be installed in just a few clicks from Softaculous in your web site's cPanel. Reselleris offers the best of Webmail tools and options, saving you time and money! How Is Reselleris.com So Affordable & Able To Offer Webmail Hosting At Such Low Prices? Cheap Webmail hosting packages are made possible by the use of the latest technology and extremely efficient systems in place here at Reselleris. We believe these savings in costs should be passed on to you the customer, and the result is low cost Webmail Hosting with the highest reliability and ease of use. Webmail (or Web-based e-mail) is an e-mail service intended to be primarily accessed via a web browser, as opposed to through a desktop e-mail client (such as Microsoft Outlook, Mozilla's Thunderbird, or Apple Inc.'s Mail). Very popular Webmail providers include Gmail, Yahoo! Mail, Hotmail, and AOL. A major advantage of Webmail over application-based e-mail is that a user has the ability to access their inbox from any Internet-connected computer around the world. However, the need for Internet access is also a drawback, in that one cannot access old messages when not connected to the Internet. Often used as an emergency access option, Webmail is a great option to have available even if not frequently used. And the best part? Through your Reselleris Hosting Plan, Webmail Hosting is available, completely free! Webmail Applications FREE with all Reselleris Hosting Accounts.. Horde Groupware Webmail Edition is a free, enterprise ready, browser based communication suite. Users can read, send and organize email messages and manage and share calendars, contacts, tasks and notes with the standards compliant components from the Horde Project. Why Should You Choose Reselleris For Your Webmail Hosting? 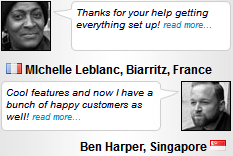 Reselleris has great experience in providing excellent Webmail support for our many happy customers. Whatever your budget, Webmail Hosting with Reselleris means reliable hosting. Webmail hosting with Reselleris.com also means easy hosting. With our incredibly wide selection of easily installed scripts from Softaculous and Webmail configuration options in the Control Panel, there really could not be an easier and more affordable way to get your Webmail Hosting up and running for you. Reselleris has provided tens of thousands of satisfied customers over the years with the most reliable and affordable of Webmail Hosting Solutions. Reselleris understand that you need high levels of reliable and competent support to get the most out of your Webmail Hosting and we are naturally proud to be considered one of the top rated Low Cost Webmail Hosting companies. You will enjoy the full support of the experienced Reselleris team, 24 hours a day, 7 days a week. Affordable Budget prices, full features, 99.9% Uptime Guarantee, No Risk Money-Back Guarantee - come and see for yourself why everyone is recommending Reselleris for Webmail Hosting! Nobody gives you more for less - Host your website with us & enjoy the Reselleris Experience for yourself!